MOST street lights in Downend. Mangotfield, Emersons Green and Staple Hill now go off between midnight and 5am in a move to cut carbon emissions, save energy and reduce costs. The change has alarmed some residents, particularly elderly people, who say they feel vulnerable when it is so dark outside. South Gloucestershire Council has been implementing its part-night lighting scheme gradually over the last couple of years and expects to complete it this month. Lighting was reduced on the A4174 Avon Ring Road and and A432 in 2011. The switch-off came in Mangotsfield in May and in most of Staple Hill and Downend last month. Certain areas remain fully lit – for example, those associated with crime or anti-social behaviour, accident blackspots and where CCTV equipment relies on street lighting. The council has restored all-night lighting to the centre of Mangotsfield village after installing traffic-calming measures. Streets that contain sheltered housing also keep the lights on – but the switch-off has caused some concern in streets where there a number of older people live. 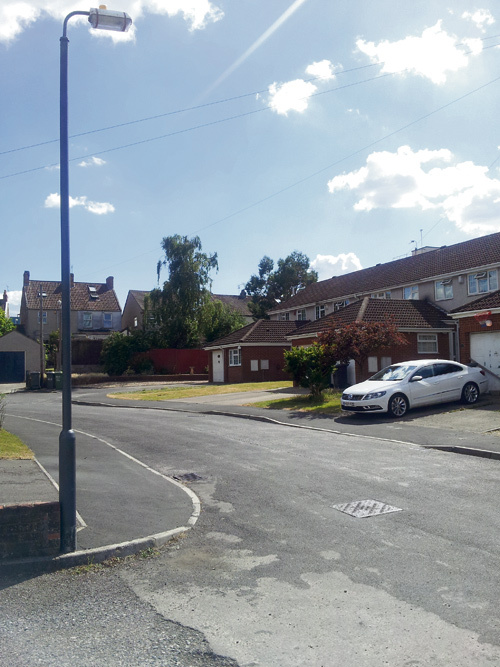 Staple Hill Councillor Shirley Potts said she had heard from several anxious residents and had been given a petition by people living in St Clements Court and Crownleaze, which she had handed in to the council. “People are finding it frightening and intimidating. They are very worried. The lights go off about midnight. A lot of elderly people are up and about at that time. The council needs to have another look at this, especially for the more urban areas,” she said. Joy Wilks, of Crownleaze, said: “It seems dangerous. People are very concerned.” Mrs Wilks said she did not know the part-night scheme was planned until the lights went off a few weeks ago. The council carried out online consultations in each area and posted notices in the library. Parish councils also consulted residents, although few people replied. The majority of responses in Downend were in favour of the switch-off. A South Gloucestershire spokesman said: “ We have received comments on our implementation plans and have made one or two modifications where a small number of individual lights have been switched back to all-night operation. The spokesman said the petition had been passed to the relevant director for review. Once the scheme is complete, approximately two-thirds of South Gloucestershire’s street lights, or nearly 20,000 units, will be switched off between the hours of midnight and 5am. The scheme is expected to reduce the district’s carbon emissions by 2,000 tonnes a year – equivalent to the annual emissions of about 900 cars.